South East marine companies found success at this year’s Queens Award announcement, with their commitment to innovation being recognised with these prestigious accolades. A total of 119 awards from all industry sectors were announced last week — 71 for international trade, 40 for innovation and eight for sustainable development. South East winners from the marine sector were the marine division of International Paint Ltd, makers of a fouling-control coating for ship hulls and propellers and marine electronics company Tacktick, makers of the Micronet range of wireless, solar-powered marine electronics. Tacktick won The Queen’s Award for Enterprise in the Innovation category for Micornet, a range of instruments for all types of boats up to 60ft. 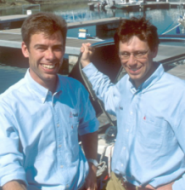 The secret of Tacktick’s success and lead in the wireless revolution is down to its roots in the dinghy market and the 10 years spent developing expertise in solar powered technology combined with low powered electronics. Besides giving reliability and performance, Tacktick displays also benefit from being self-powered, lightweight (crucial for speed and performance), impressively portable (for data information where you need it) and totally waterproof to 10m (essential for the rugged marine environment). A further 11 individuals were honoured in The Queen's Awards for Enterprise Promotion (QAEP). These awards, now in their third year, are for individuals who have played an outstanding and significant role in promoting the growth of enterprise and entrepreneurial skills and attitudes in others. One of this year's QAEP recipients was Anne Duncan, chief executive of marine leisure craft firm Yellowfin Ltd in Southampton. Duncan has devoted much voluntary effort to enterprise promotion over the years, and continues to do so.